It is a bit humbling to me as a scientist that my most quoted line ever does not come from a paper I have written. This line is "A little semantics goes a long way" and it has become one of the slogan's of the Semantic Web movement. Here's a few different ways that this term has been used and come around -- so I can help set the record straight. 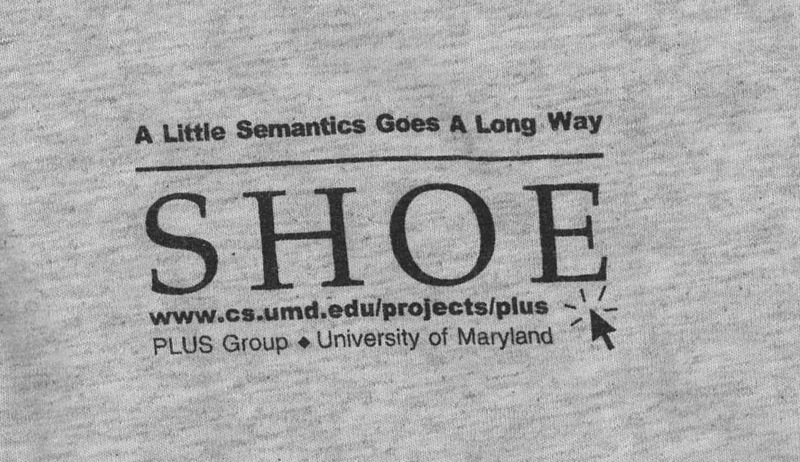 My original use of the term was on the group shirts we made for the SHOE project back in '97 or '98. My then student, Sean Luke designed a very nice logo for the shirt, but we needed a catch phrase. I suggested this phrase, as it captured the idea that SHOE was less expressive than most KR languages, but that this was by design as we were proposing AI for the Web. We ended up using the phrase on the shirts -- so the phrase definitely predates the Semantic Web effort. Google Scholar citations that use the phrase "Hendler Hypothesis"
Google search on the phrase "hendler hypothesis"
which, as you can see, is not an overwhelming number of hits, to say the least (but I'll take what I can get). Since that time, the phrase has become heavily used in the Semantic Web community, and has become something of a catchphrase in many cases. As you can see from the Google search on the phrase (in quotes) "a little semantics goes a long way" , the phrase shows up quite a lot. In published papers, according to Google scholar searching on the phrase, we see it as well. Those looking for a good citation to me having said it, it's a bit harder - the best is probably from a Keynote talk I gave at the 2003 International Semantic Web Conference. The slides from the talk are available, as is the the particular slide in which the phrase is discussed (see above). A couple of years ago I wrote a blog entry called The Dark Side of the Semantic Web which discussed the idea that the little data idea was coming along. I expanded that in a later entry (which was also republished as an editorial in IEEE Intelligent Systems) called Tales from the Darkside (continued) where i reflect that the "little" in the phrase can be very little when coupled with a lot of data. (This is citable as "Hendler, J., The Dark Side of the Semantic Web, IEEE Intelligent Systems, Jan/Feb 2007). This got some very interesting responses, which prompted me to do a later blog entitled A little is not none that addresses the issue that "no semantics" is also not an answer. Apparently, as the Semantic Web has taken off, more books are being written that visit this term. I know that it is attributed to me, but not quoted correctly, in Semantic Web for Dummies, where Jeff cites me as saying "A litte RDF goes a long way." -- but hey, getting cited in a "for dummies" is so cool that I'll forgive him [note: this was fixed in a later edition of the book]. I also learned recently that Mike Brodie has cited me in a (at this time) forthcoming book chapter -- "Michael L. Brodie, John Mylopoulos: Sewing Seeds of Conceptual Modelling in Alex Borgida, Vinay Chaudhri, Paolo Giorgini, Eric Yu (Eds), Conceptual Modeling: Foundations and Applications, Springer Verlag, June 2009." -- which is a book intended for a database (as opposed to Semantic Web) audience. However, one of the really interesting things I discovered a few years back is that one of the google hits for this phrase is this talk by Larry Birnbaum [note: as of 2012 U Colorado deleted the link,you will have to look for it in archive.org].. As Larry and I were both employees of the Yale AI project in the late 1970s, I thought maybe I had learned it there and forgotten. I asked Larry about this and he said he thought he had stolen the phrase from Marvin Minsky. So I asked Marvin, and he said "I don't think I ever said that." As Larry's talk and the SHOE shirt came out at virtually the same time, I have no idea which of us said it first. I will say that the context in which I said it (the Web) is the one it is being used in by the Semantic Web community, so I still can take credit there. However, maybe we should all start calling it the "Hendler-Birnbaum hypothesis" -- this might add enough gravitas for the phrase to catch on :-).